Sold by MILLSO AU and Fulfilled by Amazon. Gift-wrap available. 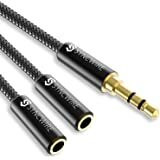 Amazon's Choice for "headphone splitter"
Outstanding Durability - The elastic and stretchable PVC sleeve is extremely tensile-resistant and effectively withstand external damage. High quality aluminum housing assure longevity. Premium Materials -T Gold plated socket and plug provide a secure hold and ensure the highest stability even with frequent plugging in and out. Professionalism down to the smallest detail. Professional Design- With a flexible cable clamp, the distance between the two sockets can be freely adjusted. This prevents the pivot-point of the splitter from breaking. 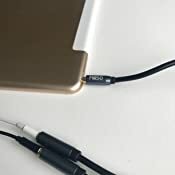 Excellent Service- The 3.5mm Jack Stereo Headphone Aux Y splitter cable is the best way to share music, movies, video or gaming with your family or friends through headphones from the same source. Sold by MILLSO AU and ships from Amazon Fulfillment. Sold by Lock Sourcing Limited Australia and ships from Amazon Fulfillment. 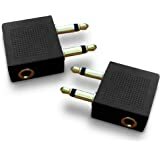 With MillSO audio splitter y cable, you do not have to listening with a pair of earphones and keep the heads tight. Everyone uses their own headphones and can listen to music or watch a movie quite relaxed and comfortable. - Tablets, PCs, Beats & Bose, MP3 players, receivers, Walkmans, Discmans and other devices. 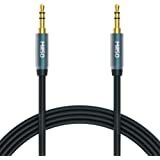 The high-purity, oxygen-free copper cables guarantee maximum and loss-free transmission of the audio signal. Enjoy a trouble-free, perfect sound experience with your HiFi stereo sound system. 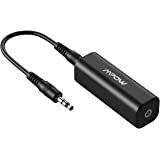 MillSO 3.5mm headset splitter is a 3-pin stereo cable and fits all 3.5mm aux port, therefore it can transmit the sound (left / right) but no microphone signal. Headphone functions such as "Play" and "Stop", "Forward" or "Back" can not support. 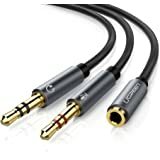 This headset splitter works very well when it comes to the audio component. It claims iPhone earphones are not compatible, however when I tested my iPhone earphones along with another pair of earphones, the stereo audio output was split fine, and quality of it was decent. 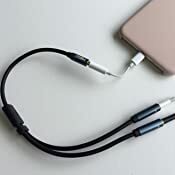 It even worked well when connecting the splitter to a lightning-to-headphone jack adapter, as my iPhone 7 Plus does not have a 3.5mm headphone jack. The microphone of the iPhone earphones however, do not work. 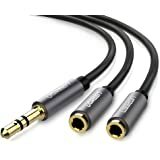 Depending on the earphones I used (all were 4 pole earphones), it seems not all are compatible with the splitter when it comes to microphone use and recording. 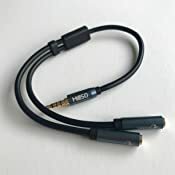 When attempting to record a voice recording or video, some microphones work when just one set of earphones is connected to the splitter, but once two are connected, the microphone for the first set no longer works. 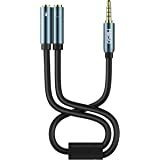 I have a pair of earphones where its microphone definitely works every time with no issues, whereas other earphones that create different tones of feedback. However, it is not very often that you’ll need to use the microphone component of the splitter. It is mainly used to share and listen to music and movies. It would be convenient to use on the plane or in public transport, where you do not want to disturb others or if you cannot hear from the speakers of your device due to external noise, yet still want to be able to share and listen with another family member or friend. The cable appears strong and thick, however a tad chunky compared to others out there. 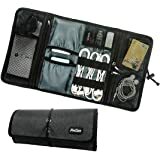 It is still convenient to carry anywhere and everywhere on-the-go. This is a well made product. 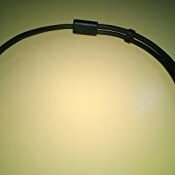 Strong cable to makes it durable and also its thick and well shielded. The connections are good quality. The look and feel of them spells quality. 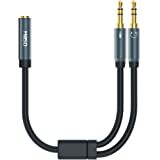 Bought this to run a soundbar and pc speakers from my computer. Works really well, no noticeable noise static, all around a really solid build. Cables are of decent thickness unlike the cheap stuff you order from china. would be easy to carry around if thats what your intent for purchase is. Highly recommend. 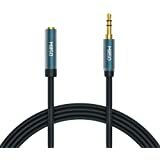 4.0 out of 5 starsMy cable was changed. 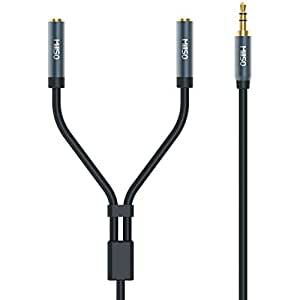 My cable came, and it had one plug for headphones and one for microphone. So it doesn't do the job of splitting one headphone cable to allow for two headphones to be plugged in. I was sent a replacement. 5.0 out of 5 starsGreat ! Nicely finished product, no dramas in operating as expected. Would buy again. Cable arrived, plugged it in, works perfectly. No complaints. What more could you want. Absolutely wonderful product, easy to use and good quality.